VIZ Media will publish Turning Point, a collection of essays, interviews, memoirs, and illustrations from animation director Hayao Miyazaki. Hayao Miyazaki's life and work from 1997 to 2008 is documented in Turning Point: 1997-2008, a memoir VIZ Media will release on April 8. The memoir includes essays, interviews, and illustrations from Miyazaki. Turning Point documents the 11 years Miyazaki's work became more popular and successful both commercially and critically, primarily with the animated film Spirited Away. Also featured in the collection are Princess Mononoke, Howl's Moving Castle, and Ponyo. 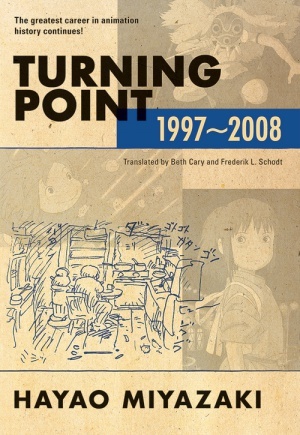 Turning Point is the companion second volume to Starting Point: 1979-1996, published by VIZ Media in 2009 and chronicles the beginning of Miyazaki's career. It features many of his earlier works, such as NausicaÃ¤ Of The Valley Of The Wind, Castle In The Sky, My Neighbor Totoro, Kiki's Delivery Service, and Porco Rosso. VIZ Media will release a paperback version of Starting Point also on April 8. Of all animation directors, Miyazaki is one of the most loved, but many people know little about Miyazaki and Studio Ghibli beyond the films they've made. Both volumes go back to the roots of Miyazaki's childhood and the founding of Studio Ghibli. VIZ Media states Turning Point is a must-read for anime aficonados and fans of entrepreneurial spirit, in particular. Hayao Miyazaki's final film The Wind Rises is in theaters now and was nominated for both a Golden Globe and an Academy Award. VIZ Media will also release on April 8 a hardcover edition of The Art of The Wind Rises in full color.